One out of two consumers pays attention to test marks when shopping. For half of the consumers surveyed, test marks are relevant for a targeted purchase decision. Test marks are of equal importance for almost all retail sectors, but particularly in the areas of toys, household goods, articles for children, sport & leisure and tools. The impartiality and independence of which they can trust. That have a high informative value. That quickly and transparently display test contents and results. And with an integrated QR code. Together with Certipedia, the digital certificate database, it forms a trustworthy system of test mark validity, reference and proof of certification. According to a decision by the German Federal Supreme Court dated 21 July 2016, test marks used in consumer advertising must always display a reference. This reference must include a summary of the applied test criteria that the consumer can easily understand. Moreover, it must always be possible to assign the mark precisely to the corresponding product. The TÜV Rheinland test mark meets these criteria, and Certipedia is an ideal reference. It presents certificates, test contents and products to consumers in an impartial and independent way. Your test mark can be easily and effectively integrated into your corporate communications. Each test mark is given an individual ID number. By entering the number at www.certipedia.com , consumers can directly view the test contents of the certificate. Upon successful certification, the Certipedia entry is automatically published in Certipedia. In addition to the test mark shown it contains a comprehensive summary of the criteria used for the testing. In this case, several test marks can be combined into one. Several certificates with different scopes have been issued for a product and these certificates are to be grouped (e.g. Tested for Harmful Substances and Quality). Or if, for several similar products, similar certificates have been issued (e.g. a toy series with only GS-tested elements). Parent IDs also receive a Certipedia entry where all assigned products and certificates are published. Certipedia is the online certificate database that makes tested quality visible at a glance, with just one click. We place TÜV Rheinland-certified products and processes online and make them available on www.certipedia.com with a designated Certipedia entry. This service is available exclusively for our customers. It enables your customers to learn about your certified services at any time. Transparency: Your Certipedia entry shows customers exactly what was certified and tested. By linking the test mark with Certipedia, your performance can be called up at any time, within seconds and worldwide. Authenticity: The authenticity of your certification can be verified using an individual ID number. Individuality: Upon request, we will customize your Certipedia entry, e.g. with your logo and other customer-relevant additional information. Simply link it to your online presences. Trust: The TÜV Rheinland test mark has been standing for quality and safety for over 140 years. The mark also means more trust and consistency for your company. Currency: Your entry on certipedia.com is always up-to-date. This is the best proof for the validity of your certificate. You want to improve the display of your test mark on Certipedia? When the test mark is published automatically, a matching Certipedia entry is created simultaneously. It contains an easy-to-understand summary of the criteria used during testing. This basic version covers the relevant legal requirements. 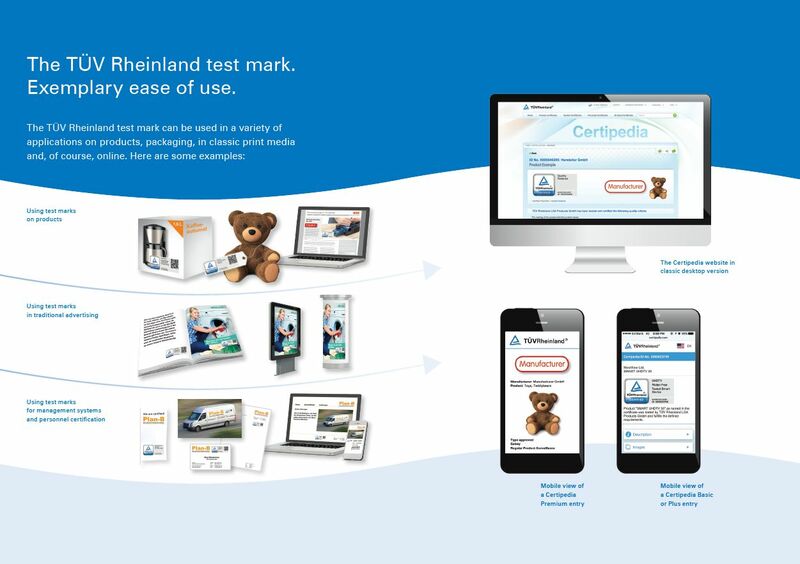 The Certipedia entry is exclusive to TÜV Rheinland customers. It serves to validate your certification. It shows all your TÜV Rheinland-certified products and services with direct access. It creates transparency and trust with customers and partners through an impartial and independent verification and presentation. It supports purchasing decisions by looking at the impartial testing and its results. The basic version can be upgraded at any time. Upgrading the basic version to "Plus" will include more than just the required information, such as added product images, customer logo, contact information, and web links. A "Premium" version contains even more added functions, such as links to other certified products, comprehensive descriptions of certified services, customer feedback and company portraits. Use the neutral platform Certipedia to confirm and highlight the qualities of your product! What Are the Benefits of a TÜV Rheinland Certification? Which marketing advantages and added values do customers gain from the individual test mark? It stands for safety and quality – for manufacturers, retailers and consumers alike. It is effective in advertising. And it serves as a valuable orientation aid for consumers and partners. It creates clarity, which strengthens confidence in brands and markets. How do I get my test mark? As a rule, the test mark with individual ID number is automatically sent to the certificate holder via a secure download link after the certification was completed. Alternatively, we will send you the files directly by email. Please contact us, if you would like the test mark to be sent early or if you would like to create a Certipedia Parent ID. How do I know whether the mark is authentic and original? Each test mark is given an individual ID number. By entering this ID number in the Certipedia certificate database at www.certipedia.com, or by scanning the QR code, you can verify whether the test mark is genuine because you will always find the name of the product and an excerpt from the certificate in the Certipedia entry. May the layout or the ID of the test mark be altered? The TÜV Rheinland test mark must not be altered. It must be used as issued with the test mark certificate by TÜV Rheinland. May the individual ID in the test mark be removed? No, the individual ID is an integral part of the mark. The test mark must always be used as it was issued by TÜV Rheinland with the test mark certificate.